Icarus and da Vinci are the source of inspiration for Claudia Marchesin and Serge Reynaud, who create unusual aerial sculptures in their workshop in the Trièves, at the foot of the Vercors range. Using birds as their models, they prepare flying contraptions in minute detail. Prepare for takeoff to Wonderland ! Air travel in the Alps was born of the daring do of ingenious inventers and talented pioneers capable of taking (occasionally) wild risks. 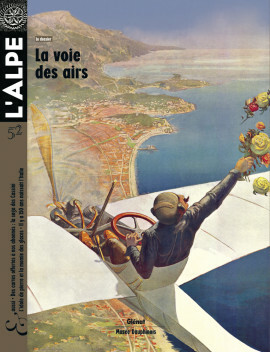 From Henri Fabre, creator of the first seaplane, and Joseph Thoret, an initiator of airborne tourism, to Bertrand Piccard who flies using the power of the sun, here is a portrait gallery of some of the marvellous (Alpine) madmen and their strange machines. In the early 1900s, the Mercantour range saw the initial (somewhat crazy) experiments of an artillery captain convinced that heavier-than-air craft would in fact fly. To the point of inventing, much later, a bizarre aerodrome. One century after the first flight across the Alps by Jorge Chavez in 1910, we followed the same itinerary, memorable for a number of reasons, with the author of this article as the pilot ! Real life following on the heels of history in a heart-felt adventure. Flight means freedom. Easier access started in California with the hang glider in the 1960s, but took off in the larger public 20 years later with the development of the paraglider in the Alps. Even today, these sports lie at the origin of very strong social networks. Map makers, geographers and astronomers for generations from the end of the 1600s to the beginning of the 1800s, the Cassini family drew maps of France of unparalleled accuracy for that time. These scientific and artistic treasures are conserved in the map library of the National geographic institute. We used some of the marvellous Alpine sections for the reproductions offered to our subscribers in 2011 and 2012. Sergio Toppi, the last of the great Italian « sequential artists », tells in his own paradoxical and mocking way the fabulous history of Ötzi, the mummy discovered in an Alpine glacier. It is not the first time that the artist from Milan, born in 1932, has addressed mountains and mineral metaphors. Italy at 150. Now what ? Does the celebration of Italy’s 150th birthday still mean anything at a time when national borders are giving way to transnational regions ? This is a chance to reflect on the new territorial entities and what identity means in a changing Europe.